Since I mentioned the constellation Corvus in a recent post, I might as well say a little more about the mythology surrounding this constellation. If you recall, Corvus is also the main villain of Dragon Quest IX, as the Celestrians in that game are named after stars and constellations. Corvus actually represents a crow, and is within close proximity of the cup Crater and the snake Hydra. All of these constellations feature into the same myth. The crow was the sacred bird of Apollo, and at one point had white feathers and a less hoarse voice. When the god commanded the crow to watch over his girlfriend Coronis, and she lost interest and cheated on Apollo anyway, the deity punished the bird by darkening its feathers. Not entirely sure how that’s a punishment, but whatever. Nor do I think it’s fair that, in these animal tales, an entire species always gets punished for one bad apple. Regardless, Apollo later asked the crow to retrieve a cup of water. On the way, the bird waited for a fig tree to ripen, then blamed the delay on a snake. For this, the god cursed the crow to eternal thirst, which accounts for the hoarse voice. He also placed this crow in the sky along with the cup and snake. You’ll notice that Crater is tilted toward Corvus but out of reach, reinforcing the thirst thing. 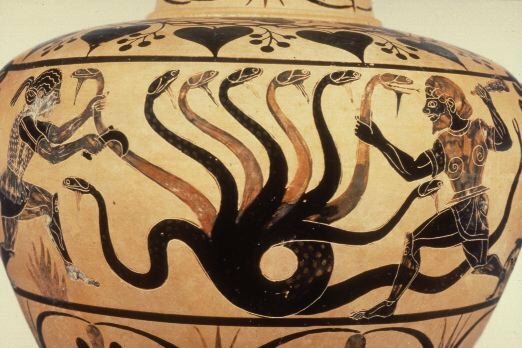 In addition to being the snake of the myth, Hydra might be the monster slain by Hercules. The only problem is that this Hydra is said to have only one head, rather than the multiple pates of the hero’s enemy. This myth is said to date back to the time of Eratosthenes of Cyrene in the third century BC, and was most famously recorded by Ovid. It’s probably not one of the older star myths, which makes some sense as Corvus is a rather faint constellation in the southern sky. In Babylonian astronomy, the constellation was seen as a raven. I have to wonder if it was the same one that served as a scout for Utnapishtim, the Babylonian equivalent of Noah. This entry was posted in Astronomy, Babylonian, Dragon Quest, Greek Mythology, Mythology, Video Games and tagged apollo, coronis, corvus, crater, crows, eratosthenes of cyrene, herakles, hercules, hydra, noah, ravens, utnapishtim. Bookmark the permalink. >in these animal tales, an entire species always gets punished for one bad apple. Not just animals. We humans are still suffering because Adam and Eve chose to eat the fruit (often referred to as an apple, but not specified in Genesis). That’s true. Humans are no exception to the unfair rule of the animal tale.